Several situations can result in warping to level 1-1. When the warp is activated, you'll be dropped from the sky and must flutter 9 times while holding right to survive. If 1-1 is completed, the game will continue on as though you had just beaten the level in which the warp was activated. 1-1 Warps can save 4-5 minutes in total in a speedrun. Each warp is performed differently depending on the level but they all follow the same general format. The area that Yoshi is sent to when he enters a pipe or screen transition is dependent on where Yoshi actually is and not which pipe/screen transition he has entered. 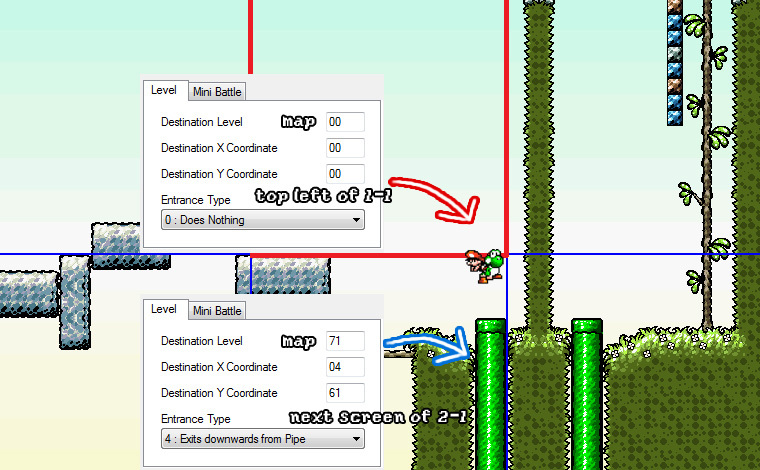 Thus, entering a pipe from a different position than normal can result in Yoshi being sent to the coordinates 0,0, the top left corner of the first level, 1-1. In the video, a pipe jump is used to activate the 1-1 Warp, followed by 9 consecutive flutters to survive the fall and complete the level. The tutorial video will teach you how to do all the relevant warps for speedrunning. This level has 2 different ways of activating the 1-1 Warp! Note: This method is way harder and should be used only as a backup if you fail the first method. Note: It is possible that you won't have enough height, even though you were standing on the Boo Blah when entering the pipe. Note: You have a 2 frame window to flutter and enter the pipe first try. You can also do perfect flutters to gain height if you don't make it with the first one. Note: Make sure to not lose speed when you do the up-spit and avoid the mud, otherwise the monkey may not cooperate with you. Note: It is a 2 frame window to do the extended flutter to get into the pipe. If you go too soon, you won't be able to travel far enough left to reach the pipe before bonking your head. If you go too late, you'll either fall to your death or won't have enough height to reach the pipe. This is easily the hardest warp to execute. Note: Warps are only allowed in 100% No Restrictions. These warps require an emulator that allows left+right inputs on the same frame or a modded/broken dpad. Left+right warps can cause several interesting effects such as softlocks, glitched levels, severe lag and save file corruption. Different emulators (and different versions/ROMs) may produce different outcomes. Where you're sent to when you do a left+right warp depends on your coin count. These are based on 2-bytes and the outcomes are believed to be at an amount of ~56k. The Warp Glitch is the glitch that makes this possible. It works by pressing < and > at the same time in the overworld. When you then start the level, it is determined by the amount of coins you have. The reason why this happens is because the game doesn't expect you to press both directions at once. So what happens when you press < + >. Well, to start things, there is an address ($36) which is input data. That means if you press > bit 0 and if you press < bit 1 of $36 is set. The game checks every frame if it should move the cursor. It does this by checking if one of the two bits in $36 is set. Since we pressed both at once, both bits will be set and the game will think it has to move the cursor. Next step is that the game checks where to move the cursor. The overworld data is at $030F for level 1-1, $0310 for level 1-2 to $0319 which is the "SCORE" button and $031A which is the button configuration. It goes on like that (so 2-1 is $031B). If a level is not unlocked the value for its address is 0, if it is however unlocked then the value will be its level number (so 1 for 1-1, 5 for 2-5, 9 for Extra and 12 for button config). Of course 11 and 12 will be always unlocked. So the game takes the current position and adds it with $(17E182+x). Where x is what you pressed (so it's 1 if you pressed >, 2 if you pressed < and 3 if you pressed both at the same time). The game only expects x to be 1 or 2, which is why $(17E182+1) = 0x01 (so + 1 to get the level after the current one), and $(17E182+2) = 0xFF (which will act as -1 to get the level before the current level). So the game checks if the next level is unlocked (it does this by bitwise ANDing the value with 0x0F), if not it will add another value until it found a level which is unlocked (which is why the cursor goes directly to the "SCORE" button when pressed right and only 1-1 is unlocked). Since we pressed both directions at the same time x is 3 which results in $(17E182+3) = 0x06, which means it will go 6 levels forward every check (which is why the cursor goes to 1-7 when it is unlocked and you try the glitch). So now it checks addresses like: $0315, $031B, $0321 ... until it reaches $037B which happens to be the current coin value and it stops there because coin amount % 0x0F is not 0 (that is the reason something different happens if you try to do the glitch with 0, 16, 32, 48, etc. coins)." All testing was done from a new file and all of the coins were collected in 1-1 unless otherwise stated. Levels on the over-world map glitch out after performing the warp, after completing the level that was warped to and some are just blank and inaccessible. This trick is a good way to bypass levels or go straight to 6-8 in glitched Any% speedruns. 00 - 1-E. Dying here and trying it again results in warping to 1-1 if done again. If 1-E is completed, Yoshi does the animation of taking Baby Mario to 1-2 on the over-world map but 1-1 is not completed. 1-Bonus is unlocked and the 1-E square is glitched. Completing 1-Bonus fixes the over-world map. 11 - The level intro is glitched and the game softlocks. 22 - 1-1. The intro is glitched but the level appears normal. 23 - 1-1. The intro is glitched but the level appears normal. 24 - 1-1. The intro is glitched but the level appears normal. 34 - 1-1. The intro is glitched but the level appears normal. 35 - 1-1. The intro is glitched but the level appears normal. 36 - 1-1. The intro is glitched but the level appears normal. 46 - 1-1. The intro is glitched but the level appears normal. 47 - 1-1. The intro is glitched but the level appears normal. 58 - 1-1. The intro is glitched but the level appears normal. 59 - 1-1. The intro is glitched but the level appears normal. 60 - 1-1. The intro is glitched but the level appears normal. 70 - The level intro is glitched and Yoshi spawns in the sky. There does not appear to be a floor. 71 - Yoshi spawns at the top left of 1-1, similar to having done a pipe jump. 72 - The level intro is glitched and Yoshi spawns in a dark house with light around him. There does not appear to be a floor. 73 - The level intro is very glitchy and Yoshi spawns in the top left of 1-1, similar to having done a pipe jump. Yoshi's colors are an inverted type of green. 74 - The level intro is blank and Yoshi spawns below the middle-ring in 6-2. 75 - The level intro is blank and Yoshi spawns in the sky of a boss room background with Kamek music playing. There does not appear to be a floor. 76 - The level intro is blank and Yoshi spawns in the sky of a waterfall background similar to 4-2. There does not appear to be a floor. Yoshi's colors are a metallic blue. 77 - The level intro is blank and Yoshi spawns in the sky of a jungle background. There is a very short drop to death and there does not appear to be a floor. Yoshi's colors are a mix green, blue and gray and Baby Mario is purple and orange. 78 - The level intro is glitchy with no text and a small Raphael is visible. The level looks like the Raphael boss fight on the moon but incredibly glitched and sideways. A text box appears slowly and Raphael rotates slowly as well. A few random sprites come from the side of the screen and then the game softlocks. 79 - This one is similar to 77 coins except with a brown/green/blue color palette. 81 - Yoshi is metallic blue and spawns in a locked section of 4-4. You can go back and play 4-4 like normally but Yoshi retains the wrong colors. 82 - The level intro is similar to 78 coins but the game softlocks after the level music starts to play. 83 - Yoshi is yellowish and spawns in the middle of some foam in 3-5. The foam pushes you left to your death. 84 - Yoshi is monochromatic and spawns in the sky. There does not appear to be a floor and fluttering to the right results in the screen changing. 85 - Yoshi is ketchup colored and spawns in the top left of 1-1, similar to having done a pipe jump. 86 - This one is similar to 78 coins. Raphael slowly rotates all the way around the moon, looks around and pounds the ground. You have control over Yoshi and if you flutter, the moon will rotate. This will spawn a bunch of random sprites and will likely softlock the game. 87 - This one is very similar to 86 coins except it may spawn different sprites. 88 - Yoshi is glitchy colored and spawns in the sky of a jungle background. At least one invisible platform is located at the bottom of the far right of the screen. 89 - Yoshi is yellow/green colored and spawns in the middle of 4-6. The level appears to be normal otherwise. 90 - Yoshi is glitchy colored and spawns in the sky of a snow level while the bonus music plays. There does not appear to be a floor. 91 - Yoshi is the regular light blue color and spawns in the sky of 1-1, similar to having done a pipe jump. 92 - The level intro is glitched. Yoshi is strangely colored and spawns in the "air" of an underwater background. There does not appear to be a floor. 93 - The level intro is blank. Yoshi is the regular purple color and spawns in the sky of 1-1, similar to having done a pipe jump. 94 - This one is similar to 78 coins. A glitched Bullet Bill Cannon sprite appears in place of Raphael, which wanders in a circle around the moon (or whatever it could be) forever. Yoshi spawns on top of the level and is able to move once the glitched Raphael sprite does. Going to the left causes very bright colored lines to flood the screen. Going to the right spawns a very glitched GOAL! sprite to appear. Both directions will cause a softlock. Yoshi can get hit by the glitched Raphael sprite and can also fall to his death. Upon death, the game asks if you want to restart at the middle-ring. A glitched, orange colored Yoshi then spawns on a red coin in level 1-1. 95 - Yoshi is a glitched purple color and spawns in the sky of 1-1, similar to having done a pipe jump. 97 - Yoshi is glitched colored and spawns in the sky with a background of happy little mountains. Horizontal speed is low but vertical speed is very high. The screen appears to wrap vertically a few times. There does not appear to be a floor. 98 - The level intro is, similar to 92 coins. Yoshi is the regular light blue color and spawns in the sky. 99 - Similar to 97 coin. This page was last edited on 28 January 2019, at 02:18.